Thank goodness for the colour on such a drab day! There is more paling foliage this week, but the golden Euonymus and Persicaria Firetail brighten up this area, and several Geraniums are still flowering in the foreground. Buried below the sagging Perovskia a brave little Persicaria ‘Blackfield’ is flowering again. This one is nowhere near as strong as Firetail, but it is also a lot younger so perhaps it will catch its big brother up one day. At the back of this view you can also see the Japanese maple turning a lovely burnt orange… when the sun shines I will have to get some prettier pictures of it to share. I am also pleased with the autumn colour of the dwarf standard Lilac tree ‘Palibin’ planted last year. It is in front of the tall pink rose at the top of the rockery, just behind the spiky Crocosmia foliage. The flowers were short-lived, but the foliage is at least nice all summer too. Perhaps you would like to join me in following a single view of your garden through the seasons, posting a photo each Tuesday. It has been a very useful and fun exercise again this year, as I observe what works, what struggles and where the gaps are for new ideas. 🙂 Thanks to all those who have joined in so far! ← In a Vase on Monday: October, October! It’s so very interesting to see the differences between the different forms of Persicaria amplexicaulis illustrated in this way. I have a few, including other more standard reds – Taurus and Fat Domino- while the variously coloured and so named ‘Field series are clearly much more sought after these days. I sold ten Orange Field in just an hour at our open garden day for charity in June, but, I’m stuck with a crate of excellent Firetail seedlings 3 months later when we close the gates. Hi Kate. A shame I don’t live nearer as I would gladly take a few Firetails off your hands! 😉 Orange Field sounds interesting – is it really orange? I must look it up. I saw Fat Domino on Cathy’s blog but was unable to find one here. I have just planted an ‘Album’. I am wary of white plants but saw it in my gardening journal here in exactly the same situation as mine, so I hope it will look good near the Gaura. So you have closed your garden for the season then? I usually have spares of allsorts of persicaria for discerning friends who are passing 😉. I find white a bit tricky too, it stands out so much – harder even than yellow for me to place comfortably. Why is that? I think part of it for me is that white flowers look pretty awful when going over. Or is that just me! LOL! It’s looking lovely and colourful. The Firetail is a real star. The garden is still looking very tidy and full of interest. Hope the sun finds you soon. After the hurricane passed through we started having crisp clean air and deep blue skies. Full of interest but not so tidy! 😉 We have had showery weather again today, but hopefully it should cheer up towards the weekend and I can get some bulbs planted! Still looking fabulous, Cathy. 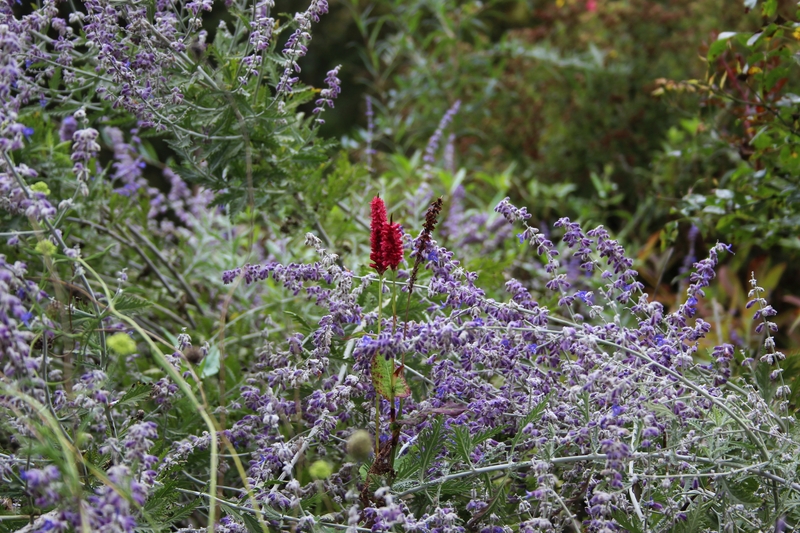 I am so impressed with the persicaria and perovskia for long-lasting bloom. Your Japanese maple is beautiful! It still looks great! Your garden is carrying on into autumn perfectly. So nice to see the lilac coloring up. I have the regular kinds and they don’t seem to do much of anything this time of year. I was actually thinking they kind of distract you from the brighter fall foliage and I’m not sure I like that…. but given that I’ve already invested several years and two of them have yet to even think of blooming I don’t think I can get rid of them. I made it again this week, such reliability comes as quite the surprise! I was quite surprised by that lilac – when I planted it last autumn it hardly had any leaves left on it. It is good to have some green foliage too though, for the contrast. I hope you will show us a close up of your burning bushes soon! At last I am seeing some change of season here too… though I’m sure it wouldn’t look like it to those of you who are waiting for (or already experiencing) the more drastic changes brought by frost! Lovely autumn view of your garden. I am falling for persicarias, there are some beauties. I love the dark flowers of Blackfield. I haven’t seen a Persicaria I don’t like yet! I have just planted a white Persicaria ‘Album’ and I hope it does as well as Firetail. Your garden is looking wonderful still. I have just been doing a bit of catching up with reading blogs (life does have a nasty habit of taking over sometimes) and I see that you have recently celebrated your birthday! Wishing you a belated happy birthday – I hope that you had a wonderful weekend. Thanks Sarah! And I am only just catching up on comments! The last few days have been rather busy here too after being away for a few days! I am very interested in following your blog, but cannot find the follow button. Hi Jean. Sorry you are having difficulties. On a tablet or pc the ‘Sign up’ button is on the lefthand sidebar, just above the calendar, and on a mobile phone it is right at the bottom of the page. Hope that helps! I do hope you get a good rain and can enjoy it Debra! I am not keen on rain from October onwards as it means greyness and mist and mostly rather cold weather too. I wonder what winter will bring this year. We hardly had any snow at all last winter. Have a lovely weekend, whatever the weather! [J] what’s the wee Box-like shrub close to the bottom of the steps, Cathy? [J] Even as I was writing the question I rather guessed the answer. I suspected it might have become overlooked. Regular gentle clipping and the leaves will be brighter, and the box will play a more positive part in the ensemble. Doesn’t need to be clipped into a regular shape, though; least of all a box! Interesting to see the border is close to the steps, I didn’t realise. 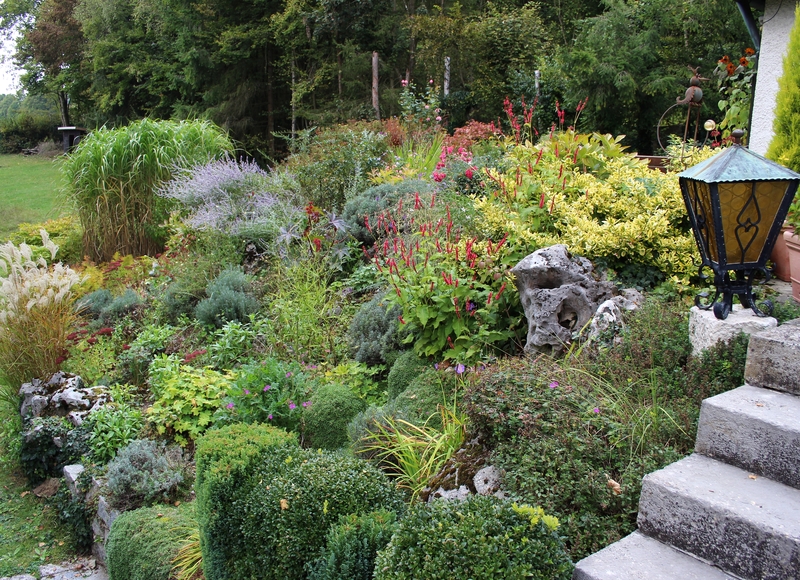 Such pleasing mounds of plants and all looking good for October. Let’s hope it’s a long Autumn. Oh, I do hope so too Dorris. The thought of winter is pretty grim! We too have a Japanese Maple turning a lovely shade of orange. We even had a touch of rain today which I loved. I know you get rain in spades so it’s not nearly as interesting. I’m glad the sun came out for a bit to smile on your gorgeous garden. Thank you, Cathy! How wonderful to have an unexpected sunny day in the garden. I’m happy for you, especially this time of year when the weather is now touch and go day today. 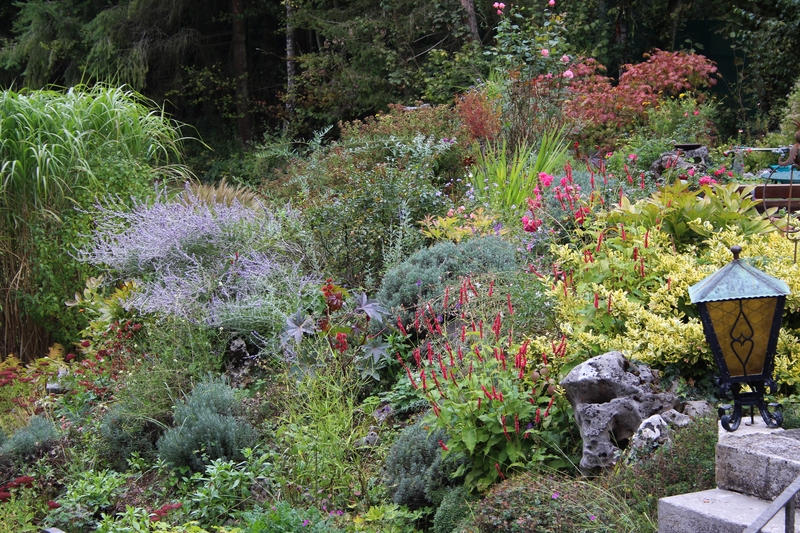 I keep coming back to this photo of your rockery and hope to use it as inspiration for our future garden in Sri Lanka. I am wondering if it would work as well for vegetables? I am thinking of planting flowers and vegetables in one place. Would love your thoughts…thanks for the inspiration. So gorgeous! Hi there. Well, I don’t see why a slope would not work for vegetables, but you would need to make terraces to prevent all your water just running off, and for accessibility. In my rockery it is a risky procedure in wet weather or in high summer to clamber in to do any work, and I never water it anyway. I would also suggest you carefully consider in which direction the slope faces, if you have the choice… mine gets full sun almost all day in summer, which can cause burning. And in winter when the sun is lower it is shaded for several months by evergreens!